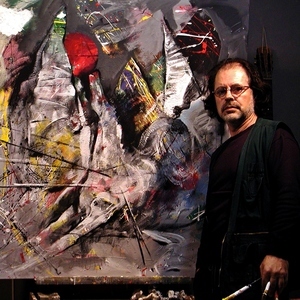 Born 1958 - Albanian Artur Muharremi is one of the most important Albanian contemporary painters. Artur Muharremi has started to create before the political changes leading Albania to democracy took place. With his well known painting 'Before Creation' (1989), Artur Muharremi was one of those very few artists, who shook off and warned the Albanian society of nineties against the crisis that was going to break. Artur Muharremi completed university studies of scenography and contributed actively and significantly as a painter and producer for the development transformation and qualitative amelioration of the animated film.